There are ways to portray difficult topics. Jacob Marx Rice did it expertly and with perfect care. Make em laugh! Laughing balances out the grief and it worked wonders. In Coping, grieving and mental health are brought to light in a story about life after a young man's suicide. Girlfriend Sarah and sister Jessica are at odds while trying to plan the funeral service for Connor. Through emotional explosions and past secret revelations, Coping shows all the signs of handling life after loss in a smart and honest manner. Coping is a well-crafted play with truthful characters and a situation that is accessible. The dynamics that Jacob Marx Rice brings to the table are quite strong. He offers a smart equilibrium of light and dark through his characters. And he knows right when to use them. 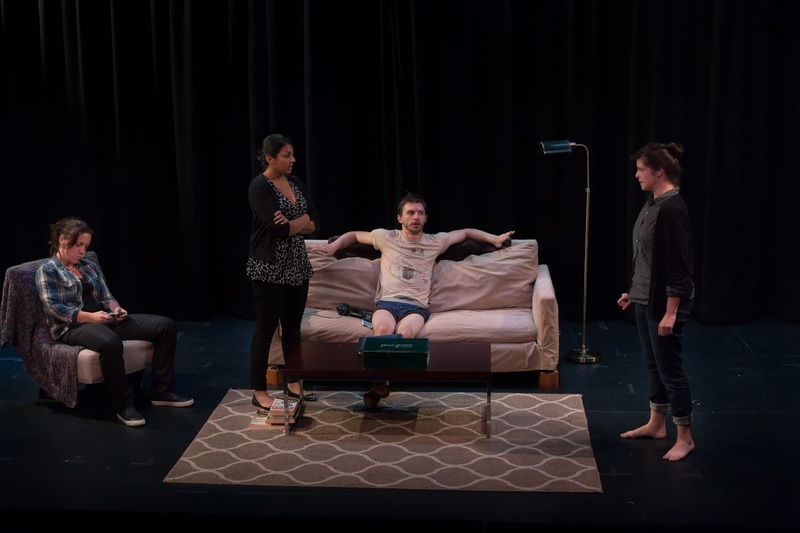 With Sarah and Jessica being the focal points in the dramatic, he brings in stoner roommate Lucas and Janie, also known as Funeral Barbie, at just the right moments Allowing the audience moments of reprieve shows the strength and precision of the writing. But the other interesting device that Rice uses is playing with Sarah’s OCD. Sarah stops the show when her mind takes over and wants a second chance at a moment. It’s jarring at first and for the stage manager inside, will likely give you a heart attack as I experienced. But again, this striking added layer to the script is what proves the great value in Jacob Marx Rice’s writing. There were certainly some super players within the tight ensemble. Lauren LaRocca gives a performance to remember. As Sarah, LaRocca has great ease in her performance. She tugs are your heart while remaining poised and resilient. There's a long career ahead of her but for now, it was the performance of a lifetime. To counter LaRocca, Lipica Shah delivers a genuine ferocity. You do not want to get on the bad side of Shah’s Jessica as she will tear you down. Yet Shah finds humility during Jessica’s crumbling moments of mourning. Scott Thomas got to serve as the official jester of comic relief and it was done effortlessly. As Lucas, Thomas was the much needed spark of merriment during the time of darkness. From his physical comedy to his character’s too stoned to be smart mentality, Thomas was just great. With a map in hand, director Anna Strasser easily found the buried treasure within Coping. Strasser pulled so much gold out of her ensemble. Strasser made things simple in the staging but one of the most under appreciated elements of her direction was her transitions. Lighting designer Asa Lipton allowed a beautiful purple glow to light the transitions in which Strasser kept her actors active. They remained in character and with just a subtle glance or stare, a story was told through the transitions. Many directors try to avoid transitions at all costs. Strasser took advantage of the moment and continued the story, never losing a beat. Coping is an amazing story brought to life by an incredible team of artists. Jacob Marx Rice doesn’t shy away from tactically writing about mental illness and grief in a manner that is both compelling and illuminating.